What do Wham’s Careless Whisper, Sade’s Smooth Operator, Hall & Oates Maneater or half of Men at Work’s songbook have in common? The sultry sweet sounds of a saxophone. 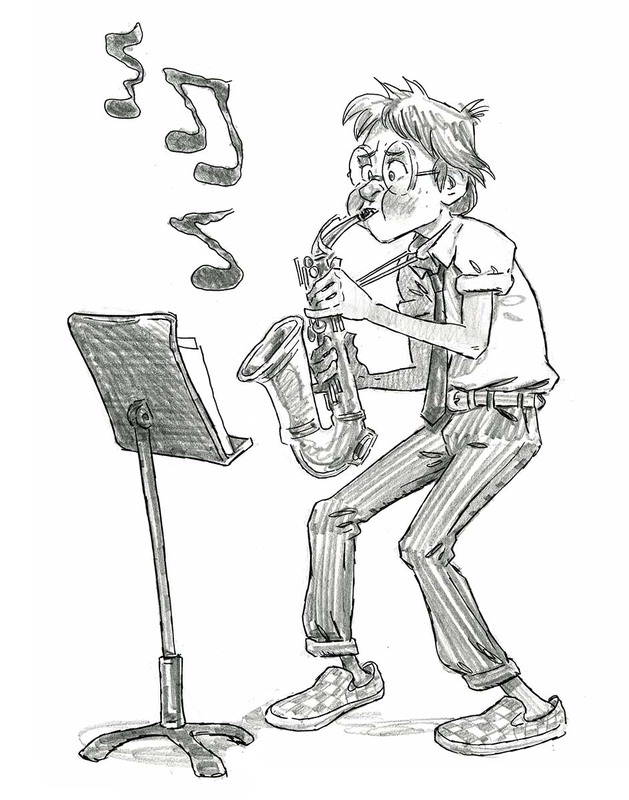 Because every song on the radio during the ’80s had an obligatory sax solo, I wanted to be a sax man. I started playing the alto sax in our middle school band. By high school I was in the marching band, which involved stomping around outside under the oppressive Florida sun, dressed in a heavy polyester uniform and honking out the notes to Toto’s Africa. I soon realized this wasn’t the path to playing backup for Huey Lewis and the News but it didn’t matter—my playing sounded less like a soul man and more like a goose having its soul ripped from its body. I quit marching band in my sophomore year and filled my schedule with art classes. Instead of trying to play their songs, I drew caricatures of Huey Lewis, Hall & Oates, Sade and Wham.